ACI 318-14 Chapter 19 covers essentials a licensed professional designer (LDP) needs to address on requirements for concrete on a project: minimum specified strength level; modulus of elasticity estimate; design modification factors when using lightweight mixes; and, durability requirements for structures subject to specific exposures. Regarding freeze-thaw cycles (Exposure Category F), the chapter clarifies descriptors of the exposure condition for concrete. Previously, all Category F classes required a maximum w/cm and minimum specified strength of 0.45 and 4,500 psi, respectively. ACI 318-14 requires Class F1, 0.55 w/cm and 3,500 psi; Class F2, 0.45 w/cm and 4,500 psi; and, Class F3, 0.40 and 4,500 psi. For plain concrete in exposure Class F3, 0.45 w/cm and 4,500 psi targets apply. In addition to its predecessor, the new code permits Type IT binder conforming to ASTM C595, Specification for Blended Hydraulic Cement, for concrete subject to water-soluble sulfates (Exposure Category S). 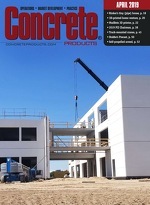 26.4 Concrete Materials and Mixture Requirements—References specifications and other requirements for materials that can be used in concrete; requirements for concrete mixtures that are related to strength, durability and construction; and, provisions for proportioning concrete and documenting proposed mixtures to the LDP. Section 26.4.3 references ACI 301, Specification for Structural Concrete, stipulating a 24-month limit on the age of a strength test record for determining standard deviation, submittals, and laboratory trial batches. Details establishing the required average strength for concrete mixtures have been eliminated from ACI 318-14. 26.5 Concrete Production and Construction—Covers production, placement, consolidation and curing provisions; cold and hot weather concreting; and, construction of members and joints. 26.12 Concrete Evaluation and Acceptance—States strength test requirements, testing frequency, strength acceptance criteria, and investigation of low strength test results. ACI is supporting the new code with more than 50 seminars throughout 2015. Most immediately, it has posted transition keys mapping 318-11 provisions to the new edition at www.concete.org/ACI318. Also planned this year is an updated Reinforced Concrete Design Manual, published in accordance with ACI 318-14. As a member of ACI Committee 318 – Structural Concrete Building Code, NRMCA Senior Vice President, Engineering Colin Lobo represented ready mixed production stakeholders in code reorganization leading to ACI 318-14. He will remain active in the committee on behalf of the association and producer members.